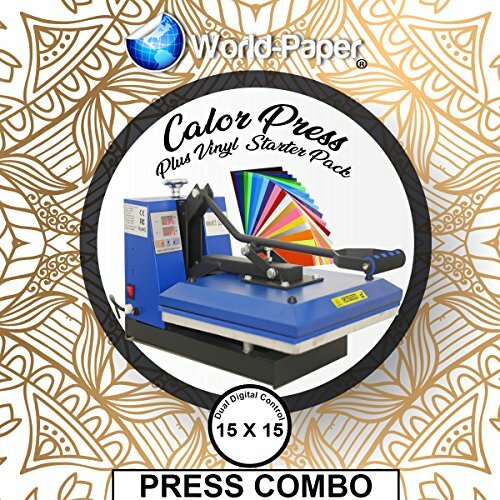 The World Paper Clam-shell Heat Press is a machine with the starter in mind. Perfect if you are looking to transfer custom graphics onto t-shirts and other clothing for the first time and need something reliable and cost effective. If you have been searching for just the right press, look no further! With its standard 15" x 15" heating element, its fast, easy to use and effective. Hard working and sturdy while providing accurate and even heat and pressure. The Dual Digital LCD screen displays accurate temperature every time with an alarm to let you know when its finished. It's great for a small work area, built with all the finish of the larger, more expensive models, fully reliable yet managing to stay affordable. Go pro without paying pro prices. Get a good start and produce a great finish!